What did you study at the Institute? 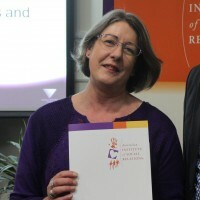 I completed the Certificate IV in Community Services Work and the Diploma of Counselling. What inspired you to pursue this study? I was a primary school teacher and taught in NT and NSW for 14 years. I then went back to University and completed a Bachelor of Justice and Society (Hons). I started a PhD but felt that I needed to be doing something more practical than theoretical. I had been volunteering for a collaborative project working with families where there were domestic and family violence issues and wanted to continue this work. The Cert IV and the Diploma have provided me with the qualifications to continue this work as a facilitator in a family support program as well as enabling me to obtain employment at Relationships Australia. Why did you choose the Institute? I chose the Institute because I had previous contact with Relationships Australia staff and I was very impressed by their professionalism, integrity and sense of social justice. I thought the Institute would be a good fit for me. At the time, Skills for All was available through the Institute and at that stage I had no finances to support further education – so all of the pieces fell into place. What was your favourite part about studying at the Institute? The flexibility of the program, the enthusiasm and support of the facilitators, and the course structure. How has your course of study been beneficial to your life and career? When I started study, I had been through a couple of years where my life had gone completely pear-shaped. I needed a new direction. Although I had two University degrees, I did not want to work in those areas anymore. The Cert IV and the Diploma provided me with other options of working in community services – an area that I had become very interested in. I am now working as Client Services Officer at RASA and am loving it. My study has reshaped my life and I find the work very fulfilling. Would you recommend the Institute to others? Definitely! The course structure is flexible; there is a mix of online and face-to-face sessions. The Institute will adapt to students’ needs and provides high quality, work-ready training.